The evolution of technology underlies a few key trends that have the satellite industry poised for change. Advances in computing power in the Earth Observation (EO) segment have led analytics providers to enter and vie to capture new vertical markets, ranging from forestry to finance. Added to this, there is a proliferation of digital technologies across industries, driving the need for satellite-based machine-to-machine (M2M) communications. It is also hard to ignore the buzz around small satellite constellations, with some that promise to serve even larger addressable markets via Low Earth Orbit (LEO) constellations for Internet-of-Things (IoT) networks. These are trends that will lead to greater data generation in the traditional satellite ecosystem, but what does this mean for the data analytics via satellite market, which lies further down the value chain? 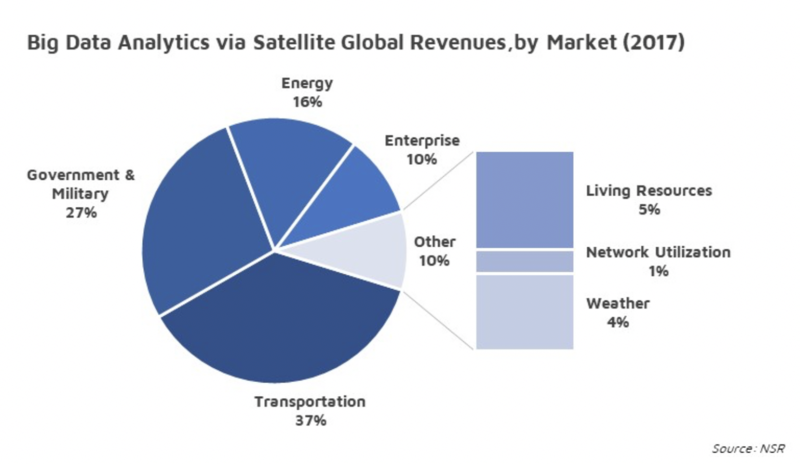 One notices that an increasing buzz of investment activity is pushing satellite data analytics forward, significantly in EO-based Big Data, which NSR expects to grow at a 23.5% CAGR through the coming decade. Earlier this month, no less than 21 geospatial industry leaders came together to announce the launch of the World Geospatial Industry Council (WGIC), aimed at co-creating larger business opportunities for the sector, and to advance its role in the world economy. These movements indicate an industry beginning to shift in its understanding and use of the data it generates, not just as a product/asset to be provided directly, but as a substrate to the larger business ecosystem of its customers. As highlighted in NSR’s Big Data Analytics via Satellite, 2nd Edition report, the global revenue opportunity from satellite-based data analytics will reach close to $3B by 2027. While fueled by the technology factors mentioned above, i.e., the digitization strategies in progress across verticals, and the rapidly developing world of machine learning in EO, a significant contribution to future growth will also come from innovations in business models, as satellite players across the value chain look to capitalize on this industrial shift. Data analytics via satellite will play a significant role in applications/organizations that are highly exposed to the physical world, both commercial (such as O&G, agriculture, commodity trading, land-cargo, etc.) and government (military and civil authorities). Amongst these, NSR’s research found the markets with the largest revenue share of data analytics via the space segment were Transportation, Government & Military (G&M) and Energy, together accounting for close to 80% of revenues generated in 2017. Satellite data serves as a new vantage point, with the greatest potential seen when it is combined with data derived from diverse sources. On the technology front, richer sensing capabilities have allowed for growth in a variety of EO-based datasets, as in the case of VanderSat’s use of microwave sensors. NSR previously noted that satellite EO is at an inflection point, with operators shifting focus towards a platform/service-based approach. M2M/IoT satcom on the other hand, provides much needed connectivity for the rising tide of digitalization in industries dependent on remote operations (such as in mining, maritime or utilities). Along with advances in cloud computing, one sees the sector has reached a tipping point in technological capability, and now stands at the cusp of a growing business opportunity for the satellite industry. Industry actors have already begun to recognize the potential here: more operators are moving down the value chain to capture a share of the revenue pie. In some cases, they introduce new products and services such as Planet with its recent launch of imagery analytic feeds. In other cases, data providers pursue partnerships (like ICEYE’s agreement with Ursa earlier this year to extract oil demand information), and acquisitions (ORBCOMM’s acquisition of transport management solutions provider Blue Tree Systems in late 2017, for instance). Such moves ensure that upstream players are not left out of the race and will also spur greater competition amongst analytics providers. End customers of the EO and M2M/IoT satcom industries are becoming increasingly aware of the value to be gained from purposeful insights into their business processes, especially with the integration of geospatial information. Satellite players recognize the potential in providing analytics to such customers, where data becomes the foundation on which organizations are able to form business decisions and structures. However, it is imperative that the sector gains clarity on the “how” of deriving ROI focused insights that prove valuable to them. If satellite data analytics is to enter and address larger parts of these markets, service providers must identify and understand the relevant questions that customers are looking to solve, whether they are strategic, tactical or operational in nature. And therein lies the art.